It was a fortuitous visit to the Nyetimber estate on a mission to buy antiques that inspired our host Simon Bladon to plant vines. A welcome glass of what he thought was champagne turned out to be English Sparkling Wine. So impressed was he that, returning home to Jenkyn Place, the grade II listed manor house in Hampshire where he lived with his family, he determined to see whether the estate he owned was suitable for grapes. Once used for the cultivation of hops, the previous owner had abandoning farming when English breweries started to buy frozen hops from America. But, as winemaker Dermot Sugrue explained, terroir for the cultivation of hops is generally good for grapes too. Where there were hops, across large swaths of Sussex, Kent and Hampshire, there are now vines. Jenkyn Place like Nyetimber turned out to be greensand soil over sandstone, bordered by chalk. Years ago this kind of soil was called the ‘banana belt’ in England because it was perfect for growing hops and fruit. And, of course, for growing grapes. Simon’s first vines were planted by hand in 2004, as Nyetimber changed hands and Dermot left to set up a new business with the owners of the Wiston Estate, Harry and Pip Goring. From the start, the winery at Wiston was intended to make wine for other local vineyards but, building a winery takes time. 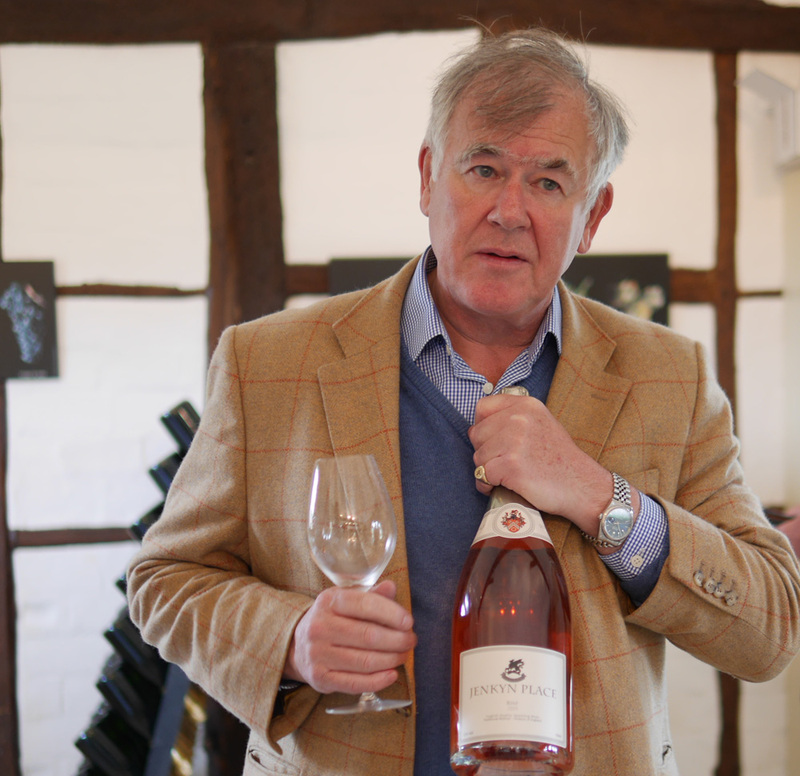 The first two vintages from Jenkyn Place were produced at Ridgeview by Mike Roberts – one of the pioneers of the English Wine business. While the vineyard itself has expanded, all harvesting is still done by hand to ensure that the grapes are in perfect condition. There have been few changes over the last 15 years. new planting is now done by a machine which can achieve in 5 hours what would take a team of three over two weeks. There are metal stakes holding the wire vine supports in later planted fields because Simon found himself constantly needing to replace rotten wood posts. 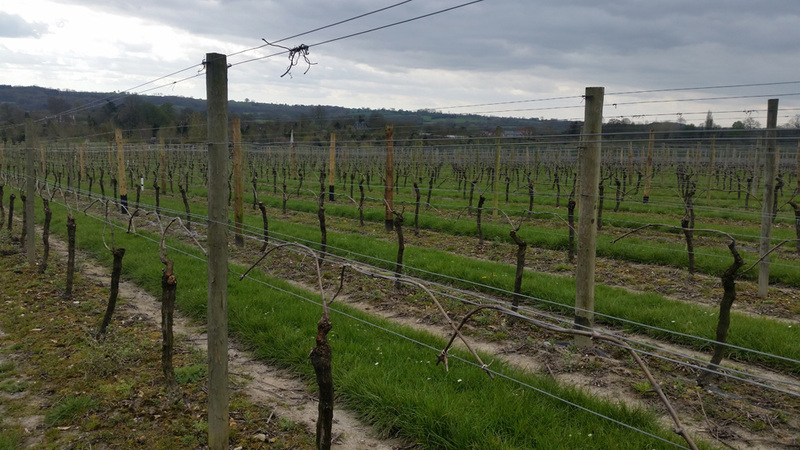 The vineyard is not organic and has no plans to move to organic methods which Simon believes are almost impossible with the unpredictable English weather. Three full-time employees look after the day to day maintenance of the vines while an itinerant Romanian workforce is brought in for harvest. And, Simon’s daughter Camilla works alongside her father looking after sales and marketing for the wines. 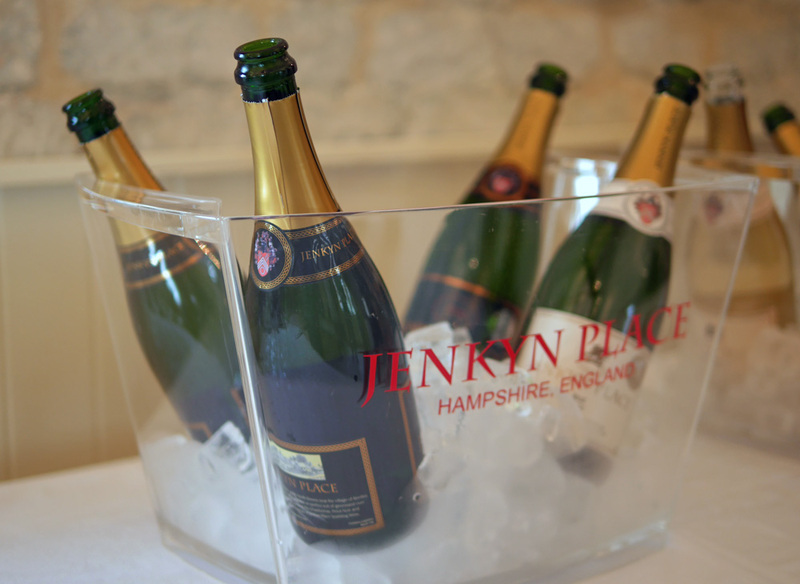 With a maximum production of around 55,000 bottles a year, Jenkyn Place is a boutique producer. The aim, to produce fine quality English Sparkling wine that warrants a price tag of around £28 a bottle. A quality drink that is a match for champagne and that will age well. We were lucky enough to go on and taste the wines for ourselves. For me, a unique opportunity to learn at first hand how a winemaker can influence the shape of a wine, tasting first three of Dermot’s wines and then the 2007 and 2006 vintages produced by Mike Roberts. We started with the 2010 Cuvee, which can be bought in Waitrose and handful of other specialist retailers. It retails at £28.50 and is a blend of the three classic champagne grapes – 60% Chardonnay, 32% Pinot Noir and 8% Pinot Meunier. Disgorged just 7 months or so ago, it has spent four years or so on lees. It’s the result of three years learning for Dermot who told us he doesn’t use a full malolactic fermentation (about 1/3 of the blend doesn’t go through malolactic). Dosage of 9g/ltr pure grape must sugar and a high level of Chardonnay are part of his strategy. He believes our climate, unlike that of Champagne, needs more chardonnay to produce a piercing linear wine and the dosage is intended to ensure the true nature of the grapes is allowed to show through. The result was a fresh, light sparkling wine that will improve over the next three years or so. The difference of a year’s aging on cork was obvious when we tasted the 2009 Cuvee, with much the same blend, it was a complex mouthful, mature and yet still fresh and light. Sadly there are only a couple of hundred bottles left of what was an excellent vintage, and, they are all promised to friends and family for summer weddings! 2008 was Dermot’s first year at Jenkyn Place and the Cuvee has a whopping 72% Chardonnay. I did like it a lot, but then I love blanc de blanc so I suspect some of that is my personal taste for a Chardonnay dominance. 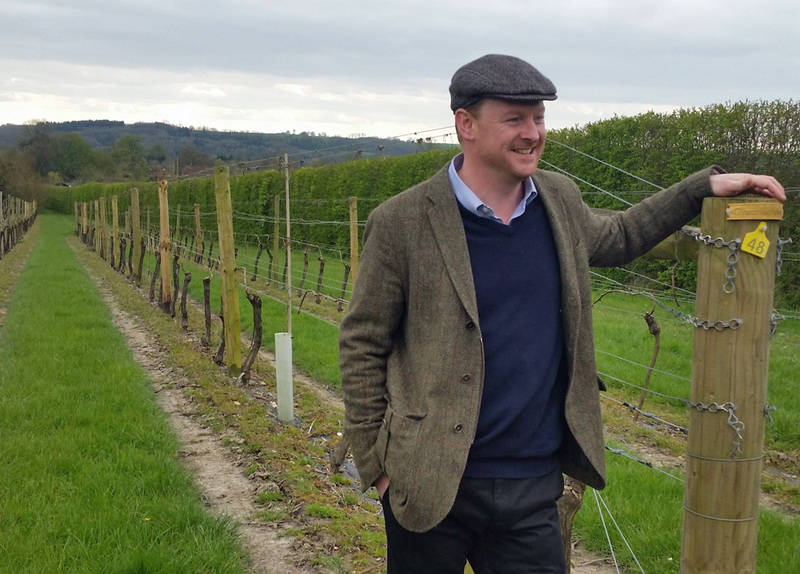 The two earlier vintages were both produced at Ridgeway by Mike Roberts. Much softer, these had a full malolactic fermentation and a higher percentage of Pinot Meunier to a 60% Chardonnay and 24% Pinot Noir. We went on to taste two Rose vintages and a Blanc de Noir. At Jenkyn Place, the strategy for what wines to produce depends very much on the nature of the Summer. The 2009 Sparkling Rose was made with 80% Pinot Noir and 20% Chardonnay. I’d just been drinking Camel Valley 2009 Sparkling Rose and they were really quite similar. The 2008 Sparkling Rose used a lower percentage of Pinot Noir (42%) to 44% Chardonnay and 14% Pinot Meunier. It was just a little too fruity and light for me. While I liked the Blanc de Noir 2010, I’ll be interested in trying it again after few years. It’s 50/50 Pinot Noir and Pinot Meunier with a dosage of just 7g/ltr and I think it will improve a lot in the next five years. Apart from thoroughly enjoying the experience of such a long vertical tasting, with both winemaker and vineyard owner there to explain the nuances of the wines, I was impressed by the aging qualities of all these wines. And by the passion and enthusiasm of all at Jenkyn Place. Sadly I doubt that I’ll ever be in a position to make my own Sparkling English Wine and I’m deeply envious of those who do – and succeed in this way.